Get a sense of the local culture at Place Royale and Old Port. Deepen your sense of the past at sights like Sanctuaire de Sainte-Anne-de-Beaupré and Lower Town (Basse-Ville). When in Quebec City, make a side trip to see Mont-Sainte-Anne in Beaupre, approximately 36 minutes away. The adventure continues: contemplate the long history of Fortifications of Quebec National Historic Site, stroll through Plains of Abraham, get lost in a book at Morrin Centre, and get to know the fascinating history of Old Quebec. To find photos, ratings, more things to do, and other tourist information, refer to the Quebec City itinerary planner. Toronto to Quebec City is an approximately 4.5-hour combination of flight and bus. You can also drive; or take a train. Plan for slightly colder nights when traveling from Toronto in April since evenings lows in Quebec City dip to 0°C. Finish up your sightseeing early on the 26th (Wed) so you can travel to Charlottetown. Your inner history buff will appreciate Cape George Point Lighthouse and St. Mary's Church. You'll discover tucked-away gems like East Point Lighthouse and Green Gables. You'll find plenty of places to visit near Charlottetown: West Point Lighthouse (in West Point), Acadian Museum (in Miscouche) and Lucy Maud Montgomery Birthplace (in New London). Spend the 30th (Sun) exploring nature at Northumberland Provincial Park. There's still lots to do: enjoy the sea views from Seacow Head Lighthouse, don't miss a visit to Wood Islands Lighthouse, take some stellar pictures from Cape Tryon Lighthouse, and take in the architecture and atmosphere at St. Peter's Anglican Cathedral. For reviews, maps, photos, and other tourist information, go to the Charlottetown itinerary builder. Getting from Quebec City to Charlottetown by flight takes about 8 hours. Other options: drive; or take a train. Traveling from Quebec City to Charlottetown, you'll lose 1 hour due to the time zone difference. April in Charlottetown sees daily highs of 8°C and lows of -1°C at night. Cap off your sightseeing on the 3rd (Wed) early enough to travel to Lunenburg. Visit Baccaro Point Lighthouse and Old Burial Ground for their historical value. Discover out-of-the-way places like Argyle Township Court House & Gaol and SS Atlantic Heritage Park Society. Venture out of the city with trips to Beach Meadows Beach Park (in Brooklyn), Rissers Beach Provincial Park (in Petite Riviere) and Peggy's Cove Lighthouse (in Peggy's Cove). There's still lots to do: enjoy the sand and surf at Hirtle's Beach, tee off at Bluenose Golf Club, steep yourself in history at Knaut-Rhuland House, and see the interesting displays at Halifax & Southwestern Railway Museum. To see reviews, photos, ratings, and other tourist information, you can read our Lunenburg itinerary builder. Do a combination of flight, bus, and taxi from Charlottetown to Lunenburg in 4.5 hours. Alternatively, you can drive; or do a combination of bus and train. In May in Lunenburg, expect temperatures between 14°C during the day and 7°C at night. Finish your sightseeing early on the 9th (Tue) so you can travel to Canmore. Satisfy your inner culture vulture at The Lake Louise Ski Resort and Banff Avenue. You'll explore the less-touristy side of things at Emerald Lake and Nature & Wildlife Tours. Explore Canmore's surroundings by going to Burgess Shale (in Yoho National Park) and Kootenay National Park (in Radium Hot Springs). On the 11th (Thu), spend an exhilarating day on the slopes at Sunshine Village. There's lots more to do: explore the activities along Grassi Lakes, take in the exciting artwork at Hot Glass Studios, take in breathtaking views at Johnston Canyon, and explore the fascinating underground world of Canmore Cave Tours. To find maps, reviews, photos, and other tourist information, read Canmore trip itinerary builder. You can fly from Lunenburg to Canmore in 10 hours. Alternatively, you can drive; or take a train. Due to the time zone difference, you'll gain 3 hours traveling from Lunenburg to Canmore. Traveling from Lunenburg in May, you can expect nighttime temperatures to be little chillier in Canmore, with lows of 0°C. Wrap up your sightseeing on the 16th (Tue) to allow time to take a bus to Jasper. Jasper is a specialized municipality in western Alberta, Canada. Do some cultural sightseeing at Angel Glacier and Beauty Creek Trail. 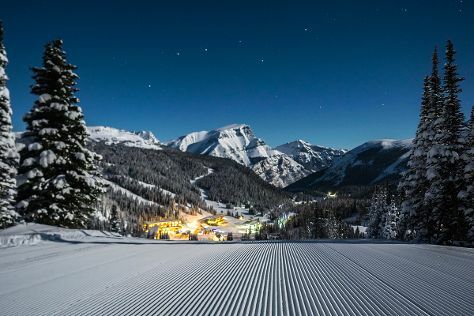 Escape the urban bustle at Marmot Basin Ski Area and Skyline Trail. And it doesn't end there: explore the activities along Pyramid and Patricia Lakes, explore the stunning scenery at Maligne Canyon, get outside with Lac Beauvert, and stroll through Cavell Meadows Trail. For reviews, maps, where to stay, and other tourist information, you can read our Jasper vacation planner. Traveling by bus from Canmore to Jasper takes 3 hours. Alternatively, you can drive. Traveling from Canmore in May, expect nights in Jasper to be about the same, around 0°C, while days are a bit warmer, around 19°C. Finish up your sightseeing early on the 23rd (Tue) so you can travel to Oliver. In tiny Oliver, practically every attraction appealing to tourists remains within walking distance of town center. Escape the urban bustle at Big White Ski Resort and Covert Farms Family Estate. Quails' Gate Winery and Cassini Cellars are good opportunities to explore the local culture. Get out of town with these interesting Oliver side-trips: Forbiden Fruit Winery (in Cawston), Grist Mill and Gardens at Keremeos (in Keremeos) and Kelowna (Myra Canyon Park & Lake Okanagan). The adventure continues: do a tasting at Orofino Winery. To see more things to do, traveler tips, other places to visit, and other tourist information, read our Oliver online itinerary creator. Traveling by combination of bus and flight from Jasper to Oliver takes 9 hours. Alternatively, you can drive; or do a combination of train and bus. Due to the time zone difference, you'll gain 1 hour traveling from Jasper to Oliver. Plan for somewhat warmer temperatures traveling from Jasper in May, with highs in Oliver at 26°C and lows at 9°C. Cap off your sightseeing on the 30th (Tue) early enough to travel to Tofino. Eschew the tourist crowds and head to Long Beach and Schooner Cove. Get some cultural insight at Amphitrite Point Lighthouse and Eagle Aerie Gallery. Step out of Tofino with an excursion to Wild Pacific Trail in Ucluelet--about 40 minutes away. 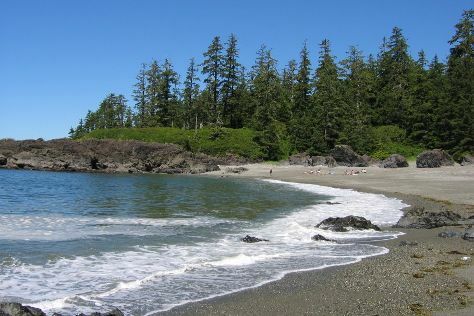 Spend the 2nd (Fri) exploring nature at Pacific Rim National Park. And it doesn't end there: enjoy the sand and surf at Chesterman Beach, look for all kinds of wild species at Maquinna Provincial Marine Park, contemplate the waterfront views at Clayoquot Sound, and witness a stunning natural landmark at Hot Springs Cove. To find photos, other places to visit, traveler tips, and tourist information, read our Tofino online itinerary creator. You can fly from Oliver to Tofino in 7 hours. Alternatively, you can drive; or do a combination of bus and flight. While traveling from Oliver, expect slightly colder days and about the same nights in Tofino, ranging from highs of 16°C to lows of 9°C. Wrap up your sightseeing on the 5th (Mon) to allow time to travel to Whistler. Explore hidden gems such as Zipline and Shannon Falls Provincial Park. Step out of the city life by going to Princess Louisa Inlet and Black Tusk Trail. When in Whistler, make a side trip to see Diamondhead Outfitters in Squamish, approximately 54 minutes away. The adventure continues: get engrossed in the history at Squamish Lil'wat Cultural Centre, explore the activities along Lost Lake, enjoy some diversion at Whistler Sliding Centre, and cruise along Sea to Sky Highway. For maps, ratings, photos, and other tourist information, read our Whistler trip builder. Do a combination of bus and flight from Tofino to Whistler in 6 hours. Alternatively, you can drive; or do a combination of bus and flight. June in Whistler sees daily highs of 22°C and lows of 9°C at night. Finish your sightseeing early on the 11th (Sun) so you can fly to Victoria. Visiting Kayaking & Canoeing and Sandcut Beach will get you outdoors. 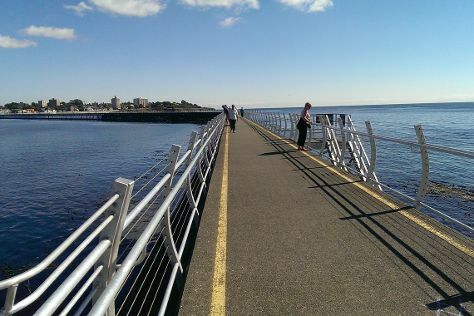 Do some cultural sightseeing at Fort Rodd Hill and Fisgard Lighthouse National Historic Sites and Christ Church Cathedral. Change things up with these side-trips from Victoria: Salt Spring Island Cheese Company (in Salt Spring Island), Sooke (Alyard Farm & Quimper Park) and Averill Creek Vineyard (in Duncan). Spend the 18th (Sun) exploring nature at Gulf Islands National Park Reserve of Canada. There's lots more to do: wander the streets of Ogden Point Terminal & Breakwater, contemplate the long history of Chinese Cemetery, explore the engaging exhibits at Miniature World, and step into the grandiose world of Hatley Castle. To see ratings, where to stay, reviews, and other tourist information, you can read our Victoria itinerary planner. Traveling by flight from Whistler to Victoria takes an hour. Alternatively, you can take a bus; or drive. June in Victoria sees daily highs of 20°C and lows of 13°C at night. Wrap up your sightseeing by early afternoon on the 19th (Mon) to allow enough time to travel back home.